Angelica Docog is the executive director of the Institute of Texan Cultures, a component of The University of Texas at San Antonio. 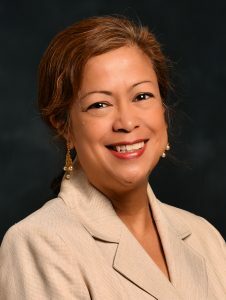 Angelica was appointment to the position in March 2012, and she is the first female and Latina-Asian to lead the Institute of Texan Cultures. Angelica’s ethnic heritage and having been raised in a military family definitely influenced her career path to work in museums and in the community. She has over 15 years of extensive experience in aspects of museum operations including curatorial, research, and interpretation. Angelica received her B.A. from Seton Hill College, in Greensburg, PA, and her M.A. from the Cooperstown Graduate Program in History Museum Studies in Cooperstown, New York. As a graduate student, she was the recipient of the New York State Minority Fellowship. Angelica is also a member of the Smithsonian Institution Affiliates advisory board and past chair of the Latino Committee of the American Alliance of Museums and the Asian Pacific Committee of the American Alliance of Museums. Angelica is on the board of the San Antonio Women’s Chamber of Commerce and the Girl Scouts of Southwest Texas. And she also serves an advisory member on the Latina Girl Scout Council, the Catholic Charities Refugee Advisory Board, and the Dialogue Institute of the Southwest Advisory Board.